A Lot Of People Are Feeling This Angry Email From A Designer Who Claims He Was Asked To "Work For Free"
Dan Cassaro's reply to the Showtime network has gone viral. 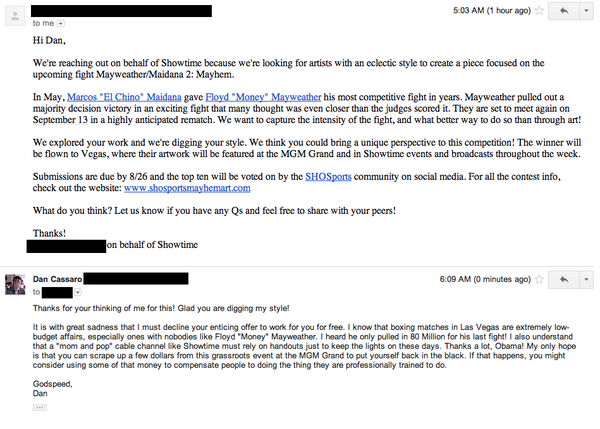 Designer Dan Cassaro was sent an invitation by Showtime to enter its Sports Mayhem Art Contest. His angry reply has been widely shared on Twitter. I don&#39;t work for free. I don't work for free. Thanks for your thinking of me for this! Glad you are digging my style! It is with great sadness that I must declne your enticing offer to work for you for free. I know that boxing matches in Las Vegas are extremely low-budget affairs, especially ones with nobodies like Floyd "Money" Mayweather. I heard he only pulled in 80 million for his last fight! I also understand that "mom and pop" cable channel like Showtime must rely on handouts just to keep the lights on these days. Thanks a lot, Obama! My only hope is that you can scrape up a few dollars from this grassroots event at the MGM Grand to put yourself back in the black. If that happens you might consider using some of that money to compensate people to doing the thing they are professionally trained to do. Showtime is a strong supporter of artists around the world. This contest, like many others, is entirely optional. Under the contest guidelines, those who choose to submit their art are eligible for a grand prize of a Las Vegas trip, in addition to invaluable national exposure across multiple platforms. He told BuzzFeed: "The whole thing is just unethical. You would never cold call a bunch of licensed electricians and ask them to do the lighting for an event like this for free. You certainly wouldn't ask them to hashtag their 'submission' on Twitter to drive traffic to your website." He added: "To call it a contest is a bit insulting. A contest is guessing how many jellybeans are in the jar so you can win all the jellybeans. ... To participate in a contest like this as a working professional devalues the work of everyone."